I've always heard how good people thought Hafler amps were but I've never heard one. I'm curious just how good are they? Would it be comparible to Adcom perhaps, or better? David ever go on to do anything else? A friend of mine...the same guy with the ARC has a pair of Haflers and has offered me the opportunity to bring them home and take a listen. He says they are a great amp. I hope you are going to take him up on it. Have they been modified? David Hafler used to be based in Pensauken NJ, just accross the bridge from Philly. His original gear was 50watt tube amps in 1954 and 20 years later he offered kits, and good quality ones at that. My oldest brother was building them on the kitchen table along with Heathkits and Dynaco tube gear. He worked a bit with David helping him refine some of his circuitry and components way back when I had no clue what he was doing. 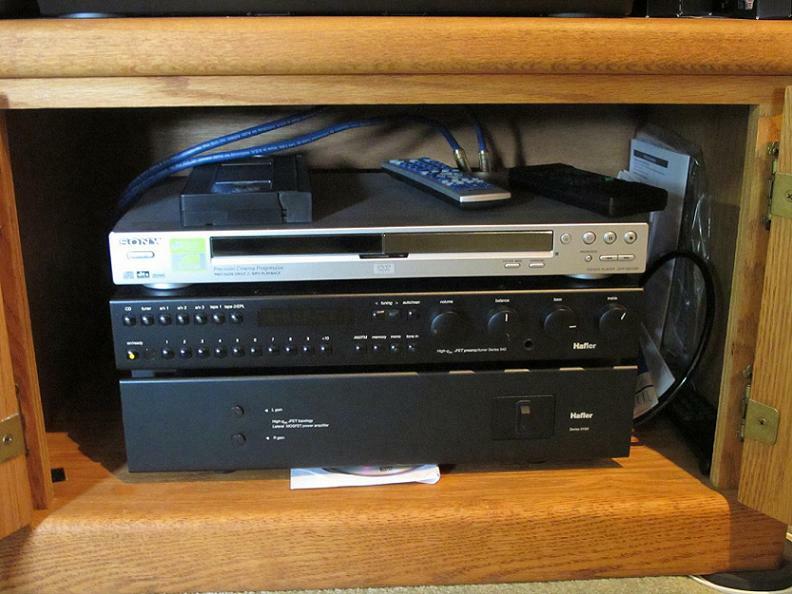 My first real stereo setup, outside of the Heathkit he built me, was a Hafler 945 Pre-Tuner and it's mate the 1081 Amp. Very good gear, build quality, performance, durability but it was from the time after Rockford had just bought him out completely and the stuff was being made in Mexico. I still have both above pcs and they are still in use. The amp has a hum, which my brother predicts is just failing caps. I plan to have it repaired-moded sometime in the near future. It is a solid small amp that would rival Adcom easily. The pre-Rockford gear will even fair better. I replaced it in my main system with the Stratos which was a step up for sure but the Hafler is still better than most entry level stuff of it's time. The older DH-1220s and 500s and such are always sought after and easily broght back to life or improved. Listen if you get the chance, they do have a sound that is different than most. Most of the older amps are pretty heavy too. My 9180 weighs in at 32lbs and it's big brother 9270 is 35 lbs. Last edited by Hyfi; 08-27-2010 at 04:06 AM. In one of our media rooms at Sony, we have a pair of Haflers 9505 driving a pair of Dunlavy SCIVs. Very nice combination. Ive got a DH 200, used almost daily. And i had a DH 220, which i unfortunatly sold. Had to feed the kids some how. I Like how the DH200 sounds. Speakers connected are a M&K Volkswoofer and thru there are Infinity RS7. For the longest time though, I had the RSe connected. e warm sounding with out losing any details and made the emits come alive(they do require some power to come alive). The resultant sound is balanced. non fatigueing(i read that emits can be fatigueing with some gear). In my opinion haflers are very good Amps. If i can get my paws on a 220 i would do it in a heart beat! Heck even a 500 would be better. and yes its been a slow but full 3 or 4 years yet! BA76, ever compare the Haflers to any other brands? Ive got a M70 yamaha. Which is 200 wpc. So it has been my Main speaker amp. From what i gather the Hafler can keep up with the Yamaha. Ive got other amps as well(the carver i mention a while back) almost forgot the Kenwood M1d. Keep in mind this has been a while back. A while back i did run my first pair of RSa with different amps. The kenwood had less bass, seemed to be more about the mids and high range. Both the hafler and the yamaha have a more neutral sound with the RSa. With the bass output in favor of the yamaha. On a wierd note the amp section on my Pioneer sx 1500td has an over all better sound than both the yamaha and hafler. And its a early 70s reciever rated at 59 wpc(go figure). when faced with speakers with a tendancy with being bright i enjoy them on the hafler. When on the pioneer said speakers tend to be very bright. Perhaps why i like the haflers so much. I have Infinity speakers. It would be easier if it wasnt so hard to get behind my entertainment center. There is like a foot and a half of space back there. Im scrawny enough that i can go back there if absolutly necessary. But doing so i risk dislodging some interconnects. One preamp to four amps can get frustrating trying to make sure all is connected securely. I guess it would also be easier if i had stranded wire on the yamaha, ive had solid 12 guage for over a year now. Im not very good at audio lingo so i hope it was understandable. Last edited by budgetaudio76; 08-27-2010 at 11:07 PM. If you look in my sig, there are pics of the dh 200 innards in there. I think it has 4 mosfet outputs per side and a 10000 uf cap for each side. Well made. Edit---most current speakers are not on there yet. The RSa have been replaced with a Koss cm 1020 pair and the RS7 are on top the Klipsch. I had a Hafler DH-220 amplifier doing a great job driving a pair of Magnepan MG-1 Improved speakers. Unfortunately that whole system including an NAD 1020A preamp was traded in when I bought our family room home theater rig from Shelley's. It seems a number of products I had trouble just disposing of in the past seems to now end up on Ebay as collector's items. 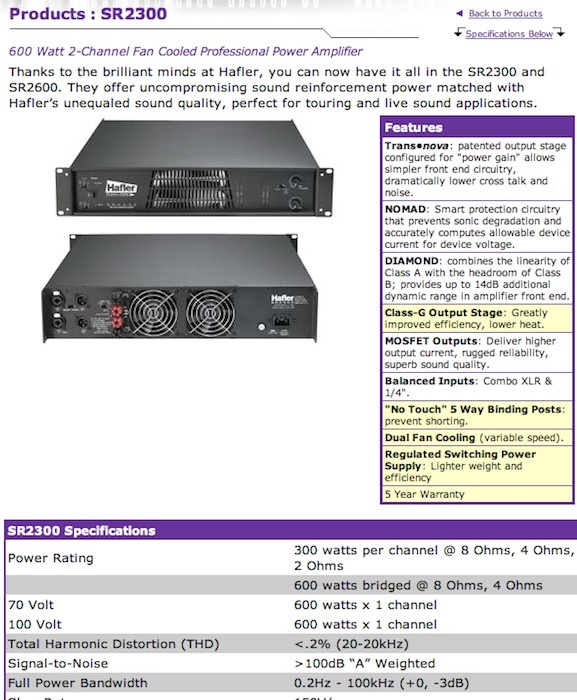 the hafler 500 is a super amp. it grips the bass of any speaker with an iron hand. great sounding too. i had one driving modified DQ10s in the house and never prior to that did i hear real low bass from a pair of DQ10s. i wish i could have bought that system but i had small children then, i was selling it for a doctor friend. it even made my Fried R IIs rattle the foundation of the house. I got several Hafler pro amps when the division was closed down. I got three SR300, one SR2600, and one GX2600 amps. That's 300W/ch, 600W/ch, and 600W/ch into 8 Ohms. Considering it averaged less than $300 each, that's 1/4 to 1/5 of full retail for new amps. Being pro, they have fans, but the good news is they never come on during my typical use, except right at start up for a second, I suppose as a functionality test. If they're off to the side or in a closet, they're both out of sight and out of hearing. Frankly, at my usage levels, I've never heard them. They're not audiophile pretty, but I listen to music more than I look at amps. The MOSFET outputs are excellent and they're clean, powerful amplifiers. I have a pair of SR2300s running a bi-amp with an external crossover on my JBL XPL200s, and they're nothing short of phenomenal. Here's a look at the key information about the last of the Haflers. Hey, filecat, good to see you. Those are beasts and a good price. They would also be a lot of fun to play with. My 9180 amp has been sitting idle for a while now. I had the 945-Pre repaired and re-capped last year and paired it with my Odyssey Stratos and an OPPO93 to drive my little Dynaudio 42s. I am not a Tone Control guy but placing the 945 in the On position but leaving the bass and treble knobs at the neutral position open up a little clarity and upper end. What I am surprised about is just how well the little Danes perform in this setup. The Stratos id putting out 260wpc into the 4ohm Danes as needed and the bass out of these little guys keeps me thinking I have much bigger speakers in the setup. The 945 also has a really good dedicated headphone circuit and the tuner is very strong. The 945 / 9180 was my first step into decent audio gear and I still have them both.